We Are Texas report out now! 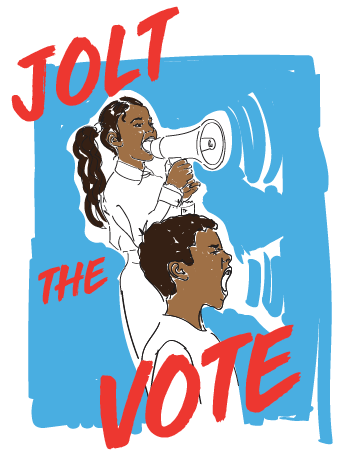 Jolt Initiative is a non-profit organization that increases the civic participation of Latinos in Texas to build a stronger democracy and ensure that everyone’s voice is heard. Jolt knows that our democracy works best when everyone gets a seat at the table. That’s why Jolt builds the leadership capacity of millennial Latinos to mobilize their peers to action. The largest study of Latino voters in Texas history. Jolt Initiative trains community members to conduct nonpartisan voter registration with their communities. Jolt Initiative’s Leadership Institute trains Latinos on advocacy, digital organizing and mobilization. We also help young people form student chapters to work on the issues that matter to them and ensure their peers are registered to vote. Jolt Initiative brings artists together to lift up the voices of Latinos and share the stories of Latinos coming together to build a strong democracy. Take A Stand for texas!